How to aggregate demand functions - FreeEconHelp.com, Learning Economics... Solved! Adding these demand functions together into a single equation is tricky because each consumer has a different maximum willingness to pay (or value where the demand curve intersects the Y axis). The best way to do it is to have two separate functions, one that is true when the price is between 8 and 10, and the other where the price is lower than 8. Note that nothing will be demanded when the price is greater than 10. For example, Q (aggregate demand) = 20 – 2P when the price is between 8 and 10 or 8<P<10 and 68 – 8P when the price is lower than or equal to 8 or P<8. The trick is that the second consumer enters the market at a price of 8, so the curve will have kink in it at this point. 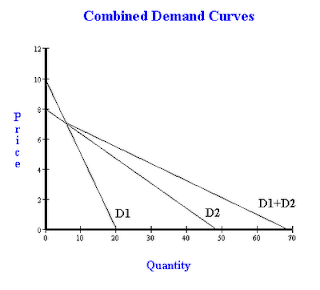 Also note that the slope of the curve lower than a price of 8 is the combined demand function of the two consumers so the slope with be flatter than any of the individual consumers. Q1 = 4,000 – 400P and we have our aggregate demand for consumer type 1. We can find the amount of product that will be derived at any given price by plugging in that price into these two demand equations and then solving for q. For example, at a price of 10, q will be 0 for both consumers (it will actually be negative for type 2 but we ignore that). At a price of 8, q will be 400 for type 1 and 0 for type 2, and a price of 4 it will be 2,400 for type 1 d 2,400 for type 2, and at a p of 0 q will be 4,000 for type 1 and 4,800 for type 2.